This is one of the biggest labor market questions and challenges in the U.S. economy. The straight answer is that the labor force participation rate sharply declined for years after the 2008 financial crisis before finally stabilizing in 2016. The real question is why fewer people are participating in the labor force. An aging population plays a role, but working age people have been dropping out of the labor force, too. Particularly prime age men. Because the unemployment rate is the number of unemployed people as a share of the size of the labor force (which is the total number of people working or looking for work), a smaller labor force helped lower the unemployment rate in addition to steady employment gains. In October 2010, the U.S. economy began the longest continuing jobs streak in its history. All 96 months since then have added jobs to the U.S. economy. However, it was not until April 2014 that the total number of employment recovered to the pre-crisis level. But reaching pre-crisis levels is not enough because the population continued to grow. After 2014, the employment-to-population ratio started to recover slowly and steadily, but it remains well below its pre-crisis levels even as the unemployment rate is now well lower than its pre-crisis levels. The gap in the strong progress of the unemployment rate versus the slow progress of the employment-to-population ratio has to do with people aging out of the labor force and working age people dropping out of the labor force. As baby boomers retire, the non-working age population grows. This puts pressure on the employment-to-population ratio, but that is not enough to explain the rapid drop after the crisis and the subsequently slow recovery. Demographic changes are gradual, not sudden (at least in this case of the U.S.). More striking is the decline in labor force participation among working age men (chart below), that only recently began to recover and is helping to drive the recent increase in the total employment-to-population ratio. 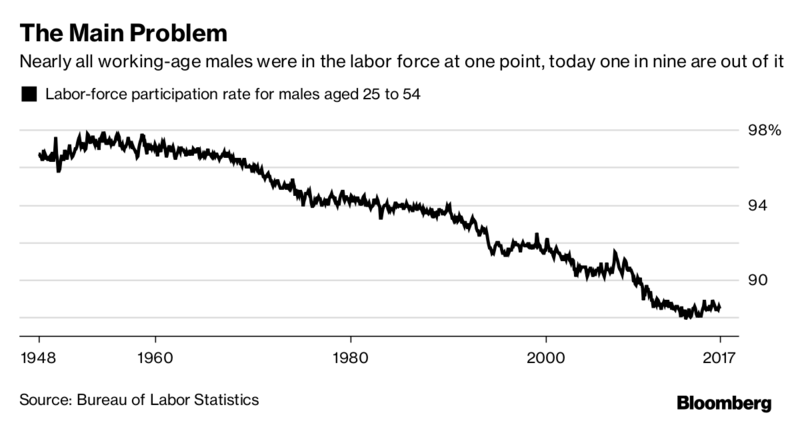 Lots of attention has gone into why prime age men dropped out of the labor force at faster rates than women and haven’t recovered as much as the rate for women. A recent paper by the San Francisco Fed and another one by the Kansas City Fed point to technological change and the decline in routine manual labor. The decline in these kinds of jobs, increasingly taken up by machines, have contributed to increasing “job polarization” where jobs are increasingly split between high- and low-skill, with not much in the middle. The jobs of the future are increasingly different than those of today. Another source of pressure that led more men to drop out of the labor face have been health related. The opioid crisis and loss of hope among many men (which is inter-related with the decline of jobs for certain groups) has led many to many discouraged workers with addiction problems (see Unequal hopes and lives in the U.S. by Carol Graham and Sergio Pinto, Brookings). For more on why more men aren’t working see Why Aren’t More Men Working? by Gregory Mankiw in the NY Times, who takes a longer term view and considers factors such as increased years of schooling. The good news is that employment-to-working age population rates are recovering. The challenge remains, however, as a bigger jobs challenge. The key for policymakers is to ensure that the future of work works for all. This means re-thinking competition policy in the digital age, the social compact between citizen and state, and a portable, flexible social safety net. ← Will the world eventually come to an equilibrium where all nations will be developed and everyone will be out of poverty?